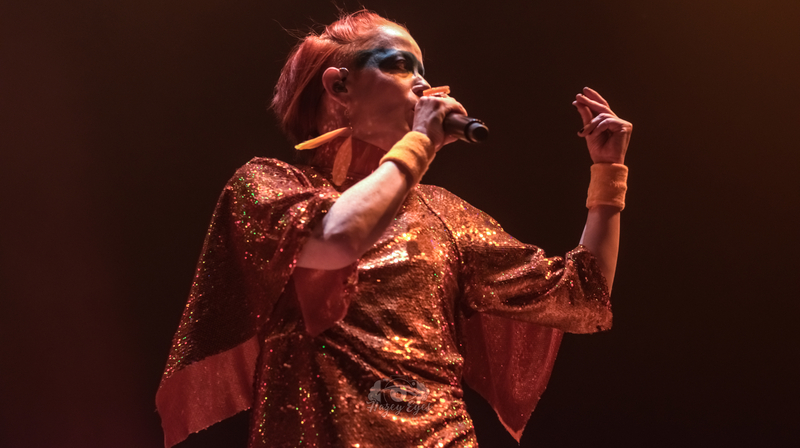 Having recently celebrated the 20th anniversary of their album Version 2.0, alt-rockers Garbage swung through Dallas Thursday night to perform the album in its entirety. Electronic duo Rituals of Mine took the stage to an already packed floor at the House of Blues. I had never heard this incredible act prior to their performance. A high energy stage presence, backed with powerful vocals by Terra Lopez, the duo provides a delightfully gloomy and noisy package. The crowd came to life and roared with excitement as the song “Ride or Die” started. Clearly, the Sacramento, California band has developed a strong following and I would recommend catching them when they are in your town. Rituals of Mine @ House of Blues, Dallas, TX. Photo by Brently Kirksey. The moment we had all been waiting for was soon upon us. Garbage took the stage just shy of 9:00 and the crowd was thick (probably three quarters full) and brimming with anticipation. Starting the set off with “Afterglow” (the b-side to the “I Think I’m Paranoid” single), the crowd started to come back to life after the intermission, moving as much as could be expected inside the crowded venue. Playing the full Version 2.0 album, plus b-sides, the set was over 20 songs deep and even had a surprise tangent by Shirley Manson about women living in a male-dominated world. The House of Blues stage is large and the band covered it quite well. Shirley chatted the crowd up between songs and gave nods to those she saw singing along with the SciFi-Pop trailblazers. “Thirteen” got a solid reaction out of the floor section, along with “Special,” “Dumb,” and “Lick the Pavement.” Pulling from the b-sides that are featured on the recently released reissue, the band played The Seeds’ “Can’t Seem to Make You Mine” and Big Star’s “Thirteen.” After the main set, the band returned for a 3-song encore that ended with “Cherry Lips” from their third album beautifulgarbage. Garbage @ House of Blues, Dallas, TX. Photo by Brently Kirksey.